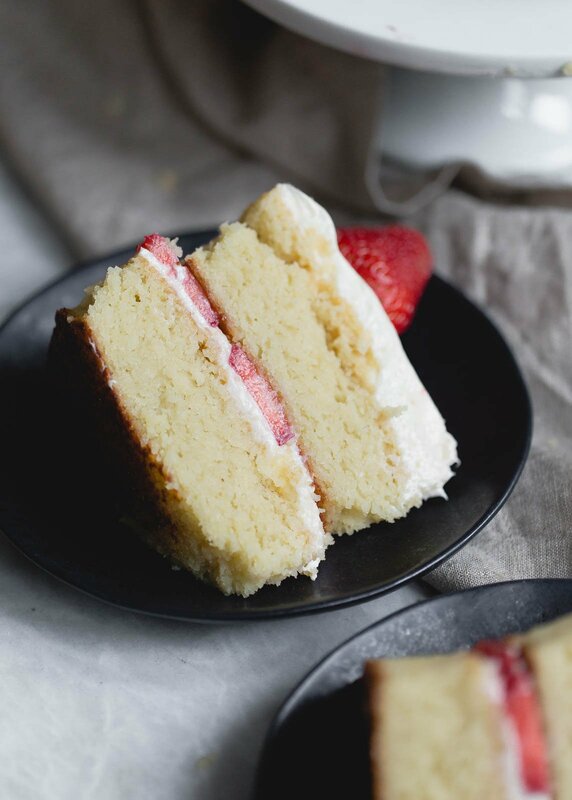 Almond Flour Strawberry Shortcake Cake with Vanilla Bean Cream Cheese Frosting + video! Looking for a beautiful grain free dessert to make for summer? 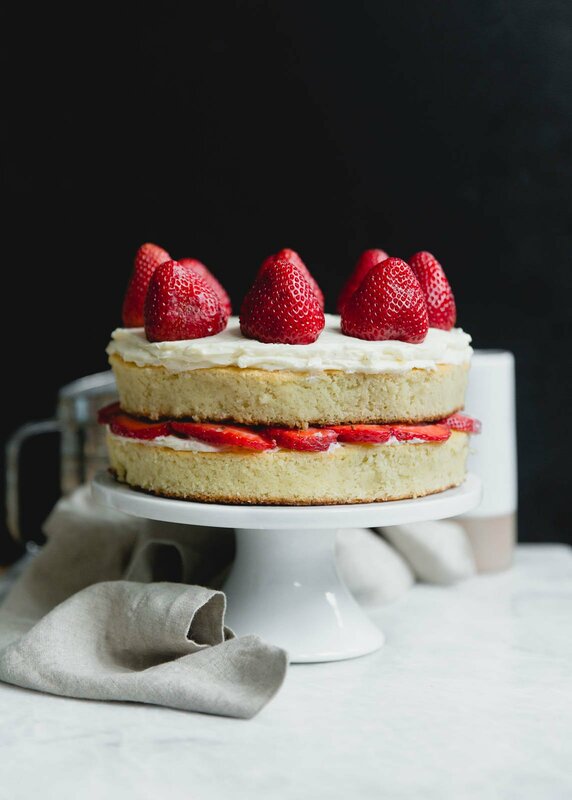 Try this gorgeous almond flour strawberry shortcake cake made with a mix of almond & coconut flour and Almond Breeze almondmilk! My Godparents have a wonderful red quaint little cabin overlooking a huge lake in northern Minnesota. There’s a tiny plot of sand in the back and two docks that extend to look out to where people go boating and jet-skiing. Many of my favorite memories as a child were there, including most of the summertime holidays like Memorial Day and 4th of July. This post is sponsored by Almond Breeze. During the summer months, we’d put our suits on and pretty much stay in them until the weekend ended. We’d run at full speed with our feet pattering on the wooden boards then jump into the cold lake with jubilant smiles. Being a child keeps you fearless like that for a while. What I remember most is after swimming for a while, we’d come wrapped in giant towels to sit on the picnic bench and enjoy a lunch our parents had made us. Grilled corn on the cob, fried walleye, my Godfather’s famous lip-smacking good buffalo wings, fresh watermelon slices and of course, a good dessert. Strawberry shortcakes always frequented the cabin. Juicy sugar-soaked strawberries piled on top of the store-bought sweet cakes and dolloped with whipped cream. It was classic but a dessert that always left you satisfied with strawberry stained lips and a smile on your face. 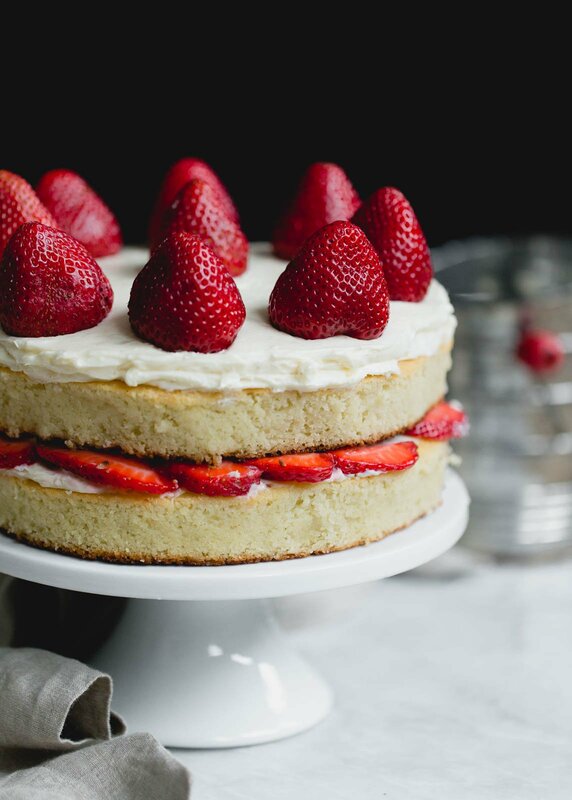 In an effort to recreate something unique with a touch of nostalgia for the upcoming summer months, I present you with this delightful strawberry shortcake cake made grain free with a mix of almond flour and coconut flour! It bakes up beautifully sweet, perfectly moist and just so happens to be both gluten free and dairy free (if you’d like). 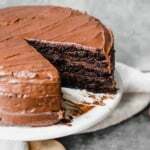 COCONUT FLOUR: Coconut flour absorbs the liquid in this recipe and also creates a nice cake texture (especially for a grain free/gluten free cake). Do not skip this because it is critical to the recipe. 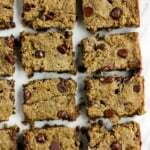 ALMOND FLOUR: I like to use a fine almond flour (rather than almond meal) in this recipe. It helps to keep the cake moist and create a light crumb texture. 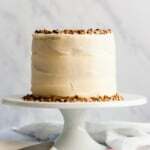 ALMOND BREEZE ALMONDMILK: The cake becomes dairy free if you use almond milk. 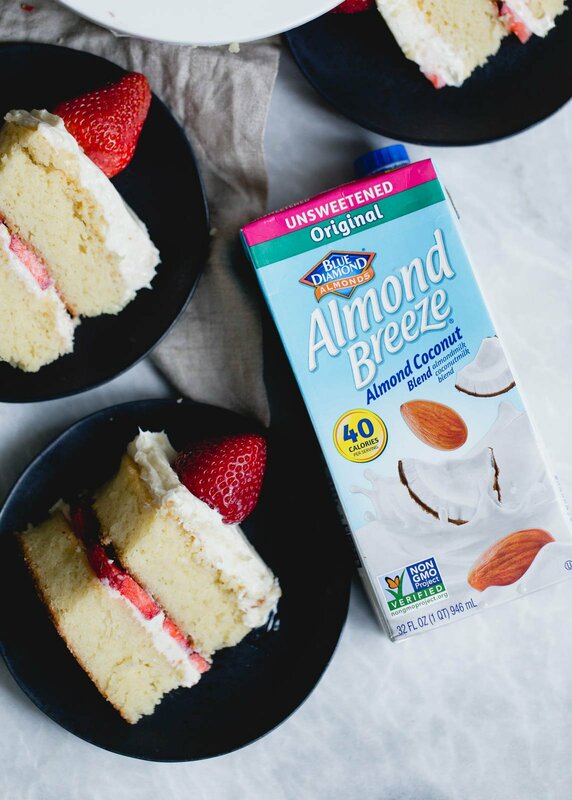 The Almond Breeze Almondmilk Coconutmilk blend is one of my favorites to use in baking recipes because of its creamy texture and slightly coconut-y flavor. Highly recommend! COCONUT OIL: Instead of butter, use coconut oil. If you prefer, you can use melted vegan butter or regular butter if dairy free, but I would reduce the amount to 3/4 cup. 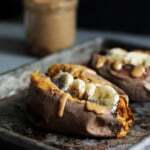 COCONUT SUGAR: I used coconut sugar in this recipe because that’s what I had on hand. Regular sugar or organic sugar also works well. Technically it’s not a true strawberry shortcake, but the flavors are my favorite together, especially with a little vanilla bean cream cheese frosting on top. And you get to use both almond flour & coconut flour — whoo hoo! And to keep it dairy free, simply use a vegan cream cheese. I hope you get a chance to try out this beautiful cake — I’m going to be making it live on my Facebook page on Wednesday, May 24th at 3PM CST so be sure to tune in. It makes a lovely birthday or celebration cake for a gluten free friend/family member and you can always top it with whatever your heart desires. xo! Preheat oven to 350 degrees F. Grease two 9 inch round pans and line the bottom with parchment paper. In a large bowl, mix the coconut oil, sugar, eggs, vanilla and almond extract together until well combined. Add the almond milk and beat again until well incorporated. In a large separate bowl, whisk the almond flour, coconut flour, baking powder and salt together. Add the dry ingredients to the wet ingredients and mix well. Mixture should be on the thicker side. Divide batter evenly between pans and spread out with a spatula to smooth the tops. Bake for 35-40 minutes or until cake is golden brown, no longer jiggly in the middle and a tester comes out clean. Let cake cool in the pan for 10 minutes then transfer to the fridge to finish cooling. Allow cake to cool in the fridge for at least an hour before removing from the pan and frosting. To make the frosting: In a large bowl, beat the cream cheese, powdered sugar, vanilla and vanilla bean together until creamy and smooth. Divide frosting in half and spread over each cake. Add sliced strawberries on top of one cake, then place the other cake on top and garnish with fresh whole strawberries. This post is in partnership with Almond Breeze. Thanks for supporting the brands that help make this site possible! 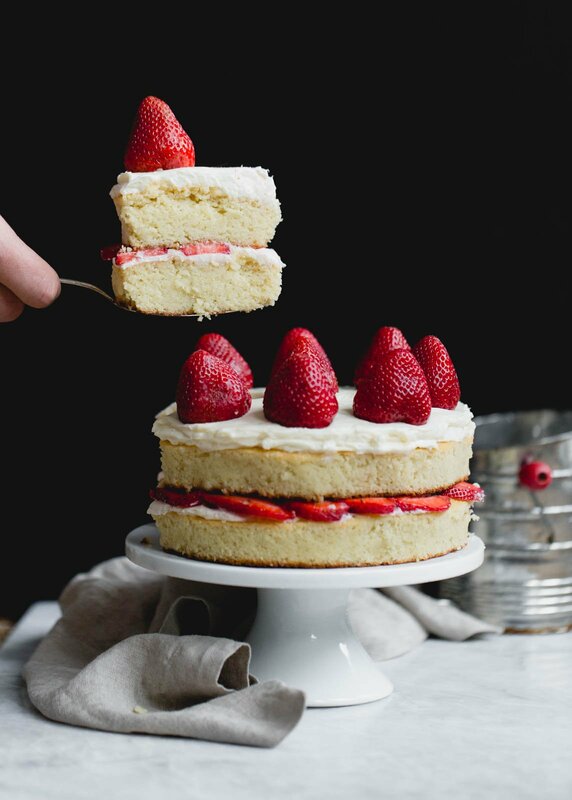 49 Responses to "Almond Flour Strawberry Shortcake Cake with Vanilla Bean Cream Cheese Frosting + video!" YESSS I am in love with ANYTHING Strawberry Shortcake. Love this healthier version. And summetime on lakes in the Midwest is the BEST. Any ideas on strawberry shortcake recipes without eggs!??? I love ❤️ your recipes Monique! Ohh this looks like my DREAM summer cake! Looks incredible! Perfect for Memorial day BBQ! 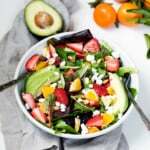 Do you have the nutritional content? I can’t wait to make this. Strawberry shortcake is one of my favorite desserts and he ingredients you used make me so happy! Any thoughts on whipped cream rather than cream cheese frosting? I always find cream cheese frosting a little dense. Does the cake need that? Thanks. I would use cultured coconut cream (dairy free). Great looking cake! And so easy. And it looks awfully tasty. Good photos, too. This is just an all around good post! thanks for this. Any alternative for eggs?can we replace them with something else (fool-proof receipe) to make it egg less cake! This was a moist delicious cake. It was a little too sweet for me. But I would definitely make it again! I did not have berries or cream cheese so I did a strawberry butter cream icing with some leftover cooked berries from breakfast. Next time I would top with whipped cream, or coconut cream, and sliced berries. I did only one 9 inch cake and it fed 8 people. Thank you for this recipe! Strawberry Cake is a favorite. Has anyone made an topping with tofu or Greek yogurt instead of cream cheese? 1 cup coconut flour means in total 750g of flour? Ps I’d love to be able to send you a photo of how the choc one came out… it was stunning! This looks great! Want to bake it for a party. Can you tell me how many it serves? Also, what is the carb count? It serves about 12-16! I didn’t calculate nutrition on this cake, but you could pop in the ingredients to an online calculator if you need to. 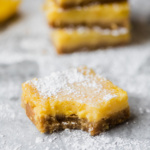 This is perfect for keto except for the sugar…..is it possible to use an artificial sweetener? I don’t use any artificial sweeteners in my recipes, so I’m not 100% sure how it will bake up! I’m making this for my baby girls 1st birthday smash cake on July 4th! Perfect for both celebrations 🙂 Only have one cake pan so have to do in batches lol womp womp! Hey Monique – thinking about trying this recipe for the 4th. Wondering if I could do a 9”x13” baking pan instead of the two 9” round pans. Have you tried it in any other size pans? Or do you have any suggestions? Thank you! Hey Nicole! Yes a 9″x13″ should work 🙂 The baking time might be a little bit shorter, but I would just check on it as it bakes! And thank you!! Hi! I made this cake before and LOVED it. I need to make some cupcakes, do you think this cake would work for cupcakes as well?! So glad you love this one! This should work as cupcakes (I’d guess about 15-20 minutes in the oven). This cake sounds great but I’d like ti make it without sugar. Can I use vegetable glycerin instead of sugar?how would I need to change the recipe because of the bulk of the sugar? I don’t bake with any sugar substitutes, so I’m not 100% sure how they turn out! I made this for my Husbands birthday a few weeks ago and it was amazing! This was the first time I used a vanilla bean and was so worth it for the flavoring! This is the perfect guilt free cake! Happy to hear that Nicole! Vanilla bean is truly a game changer. Hi, do you know nutritional values for this little thing? Hi! I actually didn’t calculate it for this cake.